A Detachment Awards Dinner was held on Saturday, 7 May 2011 at Nora's Park Cafe, 3019 Quintin Road, Brooklyn, NY. This dinner honored those who have given thier time and efforts in support of our Detachment. Awarded were Jr. Vice CARLTON RICHARDSON, for his work at the Veterans Administration Hospital, Sr. Vice JUAN RAMOS, for his leading work in the Detachment's Toys For Tots Program, Judge Advocate Edward Byrne, for his work in putting together the memorial program at last years Birthday Ball honoring Col. Donald G. Cook, the first Marine POW during the Viet Nam War and Jr. Past Commandant John Piccirillo for the many years of work, loyality and dedication to the Detachment. 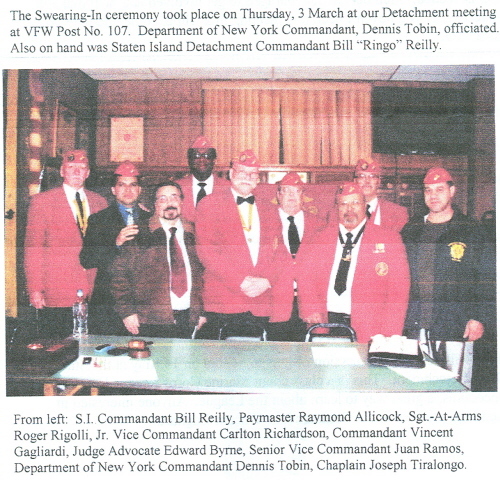 Jr. Past Commandant, John Piccirillo will be hosting a Detachment BAR_B_QUE at his home on 25 June 2011, beginning at 1500 hours. There will be the usual BBQ food fair, beer, soda and wine. "Bring your own liquer" The cost is $20.00 per person. Children under 12 are free. Bring your bathing suits! John has a nice non Olympic size swimming pool. Come and lets all enjoy a GREAT DAY! Mrs. O'Shaunnessey and Timmy, VERY close friends of John may be in attendance. New Detachment Shirts orders are now being accepted. They are similar to golf shirts and are of great quality. 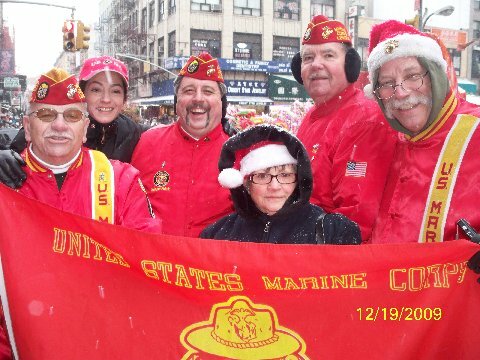 In the above photo where the EGA is, the MCL Emblem will appear with the words "Brooklyn No.1 Detachment" embroidered across the bottom in a straight line. Your name will appear on the right side of the shirt. The shirts are black and will cost $35.00. They may be picked up at the October Detachment meeting or shipped to you. Shipping charges will apply. If you are interested, please call the Detachment with your size information or any questions. if you already get E-Mails from us we have it. If you do not have access to a computer and or do not have an E-Mail address, call me at 718 812-9459. The E-Mail Newsletters will be printed and a copy will be sent to you. If you know of someone that should be receiving a copy or would like to receive a copy send us a notification. The weekend of 19-21 August 2011 a trip to Washington D.C. is planned. This trip will include a visit to 8th & I Barracks for the Evening Parade, as well as a trip to the Marine Corps Museum in Quantico, VA. Also a visit to the Mickey Finn Detachment at Quantico, just outside the Base, a vist to the Iwo Jima Memorial and Viet Nam Wall. The cost is $300.00 per person including transportation and hotel. The hotel is the Marriott Towne Place Suites in Falls Church, VA. The rooms are comparable to a studio apt. Our annual Birthday Ball will once again will be held at Buckley's Restaurant and Catering Hall, located in Brooklyn on the cornor of Avenue S and Nostrand Avenue.The date this year is Friday 11 November 2011. Journal ads are now being accepted. Help support our ball by placing an ad. Police Officer Susan Porcello (2009 Birthday Ball Guest of Honor) 2nd from left, Detachment 240 Marines Al Cavallo, Jim Seaman and Bill Novak take a moment for a quick picture with our Commandant Vincent Gagliardi and his girlfriend Diane. This program, originally an idea of member Ed Plunkett, is designed to gather, via donations, personal items, packed in a shoe box carton and sent over seas to all troops, not just Marines. We are continuing our work on this program. We are in the process of contacting main offices of large Drug Store chains, local Community Boards, political representatives and other veteran organizations, just to name a few. It is a work in progress and Detachment member help is needed. Members are encouraged to get involved and help make this a success. This years Golf Outing will be held on Wednesday, 6 June 2012 at the Dyker Beach Golf Course located at 86thStreet and 7thAvenue, Brooklyn, NY. The cost per golfer is $150.00, $525.00 per foursome. Hole sponsorships are available at $150.00 per hole. Green fees and cart, Continental Breakfast, Hot Dog and Beer or Soda at the TURN are included, as are trophies and Awards Dinner immediately following. Our Rose Program needs volunteers to help get this going. If you can spare a few hours a day once a week, please call 718-812-9459. Assistance is definitely needed. This is equivalent to the Poppy Program of the American Legion and the VFW. It is a great fund raiser. Our representatives at the Veterans Hospital are Joseph Tiralongo and Roger Rigolli. Anyone needing assistance with the VA, contact the Detachment. WOOF WOOF, Devil DOG MEMBERS!